In our collaboration with multimedia visual artist, Baron Von Fancy, we’ve found a way to bring a super-swish style to the oldest networking technology (and we have never loved our Business Cards more). I always want my work to spark an interesting conversation. This limited edition card pack stars Baron Von Fancy’s trademark bold text phrases, popping with a bright background. If you want to shake up your networking a touch, there’s no better way – bring a couple to your next conference and you won’t go unnoticed. Gordon Stevenson, also known as Baron Von Fancy, is a multimedia artist who lives and works in New York City. 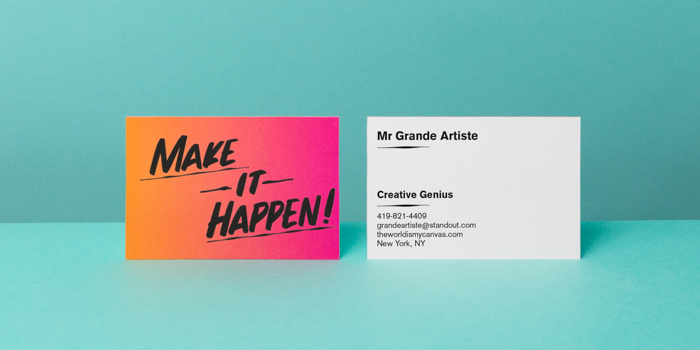 On exploring our collaboration, he said: “MOO is the first group to really make business cards cool. I always want my work to spark an interesting conversation, and MOO reflects that vision. Together we want to showcase individual creativity in the world of networking.”We’re only printing 5,000 packs of these gorgeous cards – so if you want a bit of the Baron in your pocket, act fast!